Rita Hayworth was born Margarita Carmen Dolores Cansino on October 17, 1918 at New York Nursery and Child's Hospital, in New York City. Her parents were Volga Hayworth, of Irish and English descent, and Eduardo Cansino, who came from Seville, Spain. Rita was the eldest and only girl among their three children. The boys were named Eduardo Jr. and Vernon. When Margarita was first born, the family lived in a theatrical hotel near the Palace Theater in Manhattan where her father was appearing with his sister Elisa as "The Dancing Cansinos", a dancing troupe that originated in Spain with Eduardo's father, Antonio Cansino, whom the family called "Padre". Eduardo began teaching Margarita traditional Spanish dances as soon as she was on her feet, and she turned out to be a natural. It must have been in the blood, as Volga had been a showgirl as well. Her childhood was very different from that of the everyday little girl. She spent most of her time learning dances and practicing, but the training did serve her well in preparation for her future career. By all accounts, as a child- and indeed throughout her entire life- Margarita was a very shy person, but it was a different story when she danced. Then she was full of life, vibrant and carefree. This aspect of her personality would exert itself during her childhood whenever she would take the dance floor, and later when her father made her a member of The Dancing Cansinos. 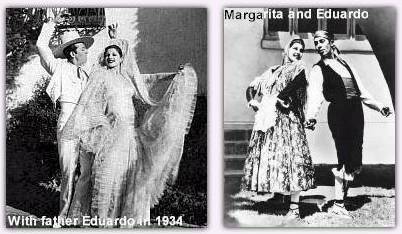 When Margarita was eight years old, the Cansino's moved westward, near Hollywood, where Eduardo opened a dancing school on Sunset and Vine Streets and landed a few jobs as choreographer in movie musicals. The school flourished at first, but as America sank deeper into The Great Depression, business dwindled and the school eventually closed (it later re-opened). He then began making occasional appearances at the Carthay Circle Theater, where he would perform the prologues. Rita appeared in one of these shows with her cousin, Gabriel. That night her unique talent impressed her father immensely. Soon after, Eduardo decided it was time for The Dancing Cansinos to make a comeback. But since his sister Elisa had moved back to Spain to raise her family, he was without a partner. He toyed with the idea of appearing with a star pupil from his dancing school, a young girl named Margo. Margarita was very hurt by this- she wanted dance! When Eduardo realized this, he decided to make Rita his partner on stage. A variation of this story has it that Eduardo chose Margarita to be his partner and she simply went along with her father's decision. But whichever way it happened, Rita's career in show business had just begun. They opened at The Foreign Club Cafe de Luxe in Tijuana, Mexico on Christmas Day in 1932. Margarita and Eduardo, as The Dancing Cansinos did shows in Agua Caliente, Tijuana, and later on a gambling ship anchored past the Mexican border. They were headliners in places like The Foreign Club Cafe de Luxe, The Hotel Caliente and other places throughout the early 30's. Rita and Eduardo were the stars of these performances and from their dances and costumes, most people assumed they were brother and sister, or even husband and wife, rather than father and daughter. These were busy times for Margarita. Between four shows a day and dancing lessons, she also had to fit in time to for school. School obviously took a back seat to her new career, and in later years she would express resentment about this upbringing. Rita's daughter, Yasmin, said that she really had mixed feelings about her childhood. On the one hand she was quite proud of having been a Dancing Cansino, and on the other hand she did feel robbed--never having had a "normal" childhood. She was either training or performing, not playing and going to school like most children. For a time, Rita and Eduardo appeared at The Caliente Club, and it was here that while performing she caught the attention of then vice-president of the Fox Film Corporation, Winfield Sheehan. Sheehan saw potential in her as a Fox star and after the show he invited Rita to join his table, which included columnist Louella Parsons. Parsons remembered Rita being "painfully shy". She later said, "She could not look at strangers when she spoke to them and her voice was so low it could hardly be heard." Nevertheless, Sheehan must have seen something in her because he invited her to make a screen test. Rita made several tests and eventually Sheehan signed her to a contract with Fox, where she began taking acting and diction lessons with the other starlets. During this time, Rita made her official screen debut in the 1935 film, Dante's Inferno, starring Spencer Tracy. 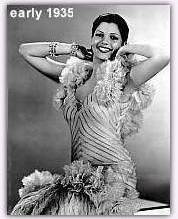 Rita's part was a dance sequence to Ernesto Lecuona's "Maria La O", partnered by Gary Leon and staged by her father. Unfortunately, the number gets cut short by a fire onboard a ship. She made a few other films for Fox in this time, such as Under the Pampas Moon and Paddy O'Day. Unlike Columbia Pictures two years later, Fox retained Rita's Latin looks. Rita was Spanish and she looked it. Sheehan capitalized on this, thinking he had found the new Dolores Del Rio, an enormously popular Hispanic actress of the time. Plans began on a remake of a 1928 Del Rio film, Ramona, in which Rita would play the lead. Ramona, was to be shot in Technicolor, with Gilbert Roland as her co-star. But by mid 1935, the Fox Film Corporation had become Twentieth Century-Fox and Darryl F. Zanuck took over. He gave Rita's part to Fox's resident leading lady, Loretta Young. Taking stock of the actors he had under contract, Zanuck did not see any potential in Rita, and decided to drop her from her contract. 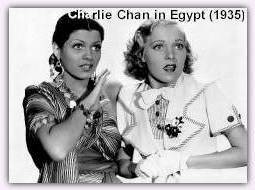 It was a major set back for her but a few years later Zanuck would have to borrow her from Columbia Pictures so she could appear in the movie that made her a major star, Blood and Sand. During this time, not under contract to any studio, Rita freelanced and found roles in movies at Grand National, Republic and other "Poverty Row" studios in a string of "B" westerns including Rebellion, Trouble in Texas and Old Louisiana. It was about this time that Rita married Ed Judson. The day was May 23, 1937 and she was the third Mrs. Edward Charles Judson. He was something of a "mystery man". No one really knew what he did. He was credited with many different professions but what is certain is that he had an eye for talent and was a very good promoter. During their marriage he campaigned on Rita's behalf, helping to advance her budding career to it's next stage, that of promising starlet. Not long after their marriage, Columbia studio head Harry Cohn signed Rita to a seven-year contract with a starting salary of two hundred dollars a week (reportedly at the behest of Judson). At Columbia, her Spanish image slowly began to fade. One of the first things they did was change her last name to her mother's maiden name, "Hayworth". 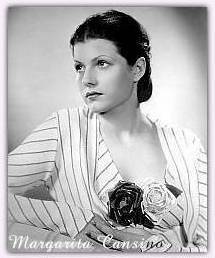 (Incidentally, "Hayworth" was indeed Volga's maiden name, according to her birth certificate, not "Haworth", as some have alleged). Rita's hair color was lightened from jet black to a shade of dark brown (her trademark auburn tresses would come later). They then moved back her hairline to give her a broader forehead and emphasize a widow's peak. With all these changes going on, she began to emerge as one of her studio's prospective stars.